WHAT WE FILIPINOS SHOULD KNOW: (Note: Underlined words are links to other related postings, point and click your cursor on a link to open). Below is an article that I received via chain letter from a good friend. Am here sharing, though not agreeing, its understandable message. In fact I am disappointed, to put it very mildly or politely, with such type of messages. This priest-writer must be dreaming (as he himself aptly began by saying " imagine"). His scenario will never materialize and will remain a figment of his imagination. We are invisible not because we Filipinos put ourselves down. We are invisible because we Filipinos do not seem to know what a nation or nationhood is. We Filipinos do not have a nation, thus do not come from a nation. We come from a conglomeration of many islands and tribes called a country. OK let's use the term nation, we are a nation, that is, a nation of strangers. We Filipinos in the homeland are not united. What more of Filipinos spread all over the world? By comparison, even relatively recent arrivals to the USA, such as the Vietnamese or even Afghans, are more united than we are; they have a united voice. Thus it is more probable that the true Filipino -the decolonized Filipino- is vanishing, given that nationalism is unappreciated. We do not even have in our consciousness that we have a damaged culture, thus we happily prostitute our country, people and patrimony to foreigners and foreign countries. That is why "they", aka foreigners (Americans, Chinese, Japanese, Koreans, and foreign corporations, and their few native partners such as the government bureaucrats and technocrats, economic and political elites, etc. ), love our homeland and people. We Filipinos lack national unity and dignity; thus no feelings for the common good and national sovereignty -not even know what it means, our naïve and sentimental attitude and behavior which drive us to love a pat in the back by and the sweet nothings of the white folks/caucasian foreigners; and so we gladly bend over. And "they" take over. We are gullible and so they, supposedly visitors to our homeland, take over our "house," our women and children, our national resources. They have in effect controlled and ruled over our country (via our mendicant leadership and the so-called educated class). And so we leave it for them to enjoy. We therefore deserve such treatment and predicament, given our slavish attitude and behavior. For the greater part, it is only when we come to know ourselves, by learning and understanding our history -the "why, how, where and when" of our people, can we change towards a nationalist and populist direction. It is only when we continuously fight to successfully defeat illiteracy and thus develop critical thinking can we radically change our society and be able to persistently work towards a more humane society for our future generations of native Filipinos. 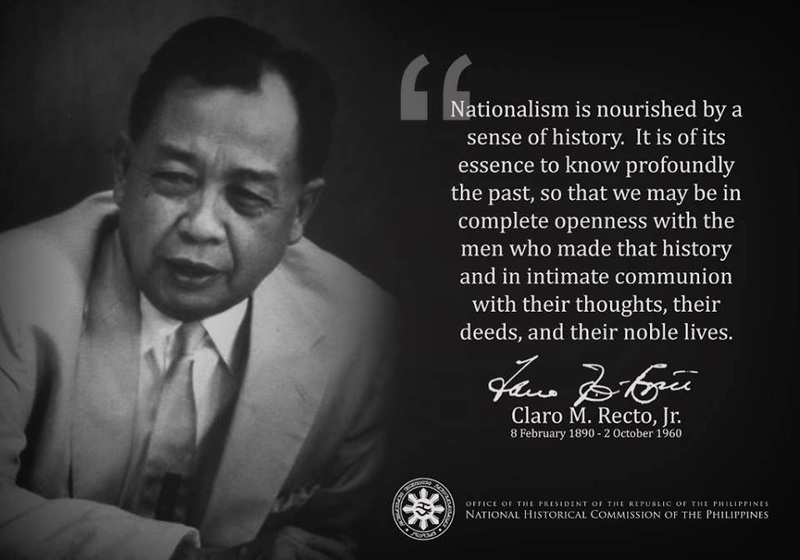 But then again we need a truly nationalistic revival and movement towards an educated mass-supported/nationalistic revolution to implement/realize such "dreams" (since the days of Rizal, Bonifacio, Mabini and for the impoverished majority of today and the future generations of "indios" or native Filipinos). Let's imagine then, not just California, but the entire world, waking up one day to discover Filipinos have disappeared. I'm talking here about the six or seven million Filipinos currently working overseas in countries with names that run the entire alphabet, from Angola to Zimbabwe. Let's not worry first about why or how the Filipinos disappeared; in fact, it becomes academic whether it's a day or a week. Just imagine a world without Filipinos. Think of the homes that are dependent on Filipino housekeepers, nannies, caregivers. The homes would be chaotic as kids cry out for their nannies. Hong Kong and Singaporean and Taiwanese yuppie couples are now forced to stay home and realizing, goodness, there's so much of housework that has to be handled and how demanding their kids can be and hey, what's this strange language they're babbling in? It's not just the children that are affected. The problems are even more serious with the elderly in homes and nursing institutions, because Filipino caregivers have provided so much of the critical services they need. When temporary contractual workers are brought in from among non-Filipinos, the elderly complain. They want their Filipino caregivers back because they have that special touch, that extra patience and willingness to stay an hour more when needed. Hospitals, too, are adversely affected because so many of the disappeared Filipinos were physicians, nurses and other health professionals. All appointments for rehabilitation services, from children with speech problems to stroke survivors, are indefinitely postponed because of disappeared speech pathologists, occupational and physical therapists! Eventually, the hospital administrators announce they won't take in any more patients unless the conditions are serious. Patients are told to follow their doctors' written orders and, if they have questions, to seek advice on several Internet medical sites. But within two days, the hospitals are swamped with new complaints. The web sites aren't working because of missing Filipino web designers and web site managers. Service establishments throughout the world -- restaurants, supermarkets, hotels -- all close down because of their missing key staff involved in management and maintenance. In Asia, hotels complain about the missing bands and singers. In the United States, many commercial establishments have to close shop, not just because of the missing Filipino sales staff but because their suppliers have all been sending in notices about delays in shipments. Yup, the shipping industry has gone into a crisis because of missing Filipino seafarers. The shipping firms begin to look into the emergency recruitment of non-Filipino seafarers but then declare another crisis: They're running out of supplies of oil for their ships because the Middle Eastern countries have come to a standstill without their Filipino workers, including quite a few working for the oil industry. Frantic presidents and prime ministers call on the United Nations to convene a special session of the Security Council but Kofi Annan says he can't do that because the UN system itself is on the edge, with so many of their secretarial and clerical staff, as well as translators, having disappeared from their main headquarters in New York and Geneva, as well as their regional offices throughout the world. Quite a number of UN services, especially refugee camps, are also in danger of closing down because of missing Filipino health professionals and teachers. Annan also explains that he can't convene UN meetings because the airports in New York, Washington and other major US cities have been shut down. The reason? The disappeared Filipinos included quite a few airport security personnel who used to check passengers and their baggage. Annan calls on the World Bank and international private foundations for assistance but they're crippled, too, because their Filipino consultants and staff are nowhere to be seen. Funds can't be remitted and projects can't run without the technical assistance provided for by Filipinos. An exasperated Annan calls on religious leaders to pray, and pray hard. But when he phones the Pope, he is told the Catholic Church, too, is in crisis because the disappeared include the many Filipino priests and nuns in Rome who help run day-to-day activities, as well as missionaries in the frontlines of remote posts, often the only ones providing basic social services. As they converse, Annan and the Pope agree on one thing: the world has become a quieter place since the Filipinos disappeared. It isn't just the silencing of work and office equipment formerly handled by Filipinos; no, it seems there's much less laughter now that the Filipinos aren't around, both the laughter of the Filipinos and those they served. I know, I know, I'm exaggerating the contributions of Filipinos to the world but I'm doing what the producers of "A Day without Mexicans" had in mind: using a bit of hyperbole to shake people up. As their blurb for the film goes: "How do you make the invisible, visible? Make them invisible." As I wrote this column, I did realize I was doing this not so much for the Hong Kong Chinese and Taiwanese and Singaporeans and Americans who don't appreciate us enough, than for us, who as Filipinos, are pretty good at putting ourselves down, at making ourselves invisible. Whether one is dealing with animate or inanimate issue, one has to know and understand its history: the "what, when, how and why;" Statesmen, politicians, lobbyists,doctors, engineers, teachers, lawyers, etc. do so in their professions to be effcetive and efficient. It comes from knowledge of the people who create such emotions and thinking, such attitude and behaviour. And those are based on the past, and the past is what is called history, whether it was yesterday or years/eons ago. And objectively speaking, we are talking of recorded history (honest or dishonest ones) and that is why one, who is serious in his pursuit of truth to reslove the issue, needs to deeply study its past if he wants complete understanding, a prerequisite to defining alternatives, evaluating them and forming a deciding on a solution (s). “Let us not blame each other, but let us, instead, help one another because there is no solution until all else is forgiven and ill will set aside.” ---- unfortunately kindness and compassion cannot be forced, they have to come “naturally” from the human heart, and who really wants hypocrisy? and to the question “is there no need for human greed?” the answer is: yes when these oppressors die. I think that what we should do is BLAME AND JUDGE and work from there. “help one another” is this directed to the lowly worker in EPZA (here in Cavite where I live) living on 200 pesos a day, lining up through rain and shine just to get a job cuz he was laid off after 3 months (contractualization) sending all his money to the province; or to a politician stealing billions of taxpayer’s money? “If resentments, pain, hurt, and all the bad feeling can neither be forgotten nor forgiven, then let us forget about humility and humanity as well.” ---- in a personal, private level this is wonderful, and signifies harmonious relationship w/ nature. Indeed I believe that this is the only way we can LIVE- the realization that time is cyclical and that after great pain and sorrow comes ecstasy. But as a body politic, I think we should first LEARN AND UNDERSTAND the causes of the “resentments and pain” the how and why (conditions) of their (poor people’s) miserable existence, and work from there- will the “oppressed” (oppressed as a political term ONLY- but in essence there would really be no distinction) forgive and forget? Maybe… after they are already eating 3 meals a day and have DECENT LIVES. Anyway hope to hear from you again. Thanks Bert for the posts. Thanks for this post and the others as well. The Filipinos are indeed everywhere. No use to blame and label present and past presidents as pimps,which I admittedly call some presidents when I am not looking before leaping. That is why it is hard to make Foreign policies for a country like us. It is hard to take sides in a war,because for sure we have Filipinos in any side. That is why now,I am wondering when the time would be to start an evacuation plan for the Filipinos in Israel.